This customizable 2200 mAh power bank from AnyPromo can quickly recharge your phone or mobile device battery up to 2 times in as little as one hour. The metallic surface and optional screen print complement each other for high quality look that complements any brand. The Custom Mobile Charger Power Bank is small enough to make it convenient for on-the-go use which makes it ideal for storage in a purse, glove box, auto, or briefcase for emergency use. Each Power Bank features four LED blue lights which indicate remaining power and the status indicator to show percentage of recharge done at a glance. If you're looking for a product that can save the day, look no further. Our compact rechargeable Cell Phone Power Bank is the ideal promotional product to "eliminate the dead battery drama" while using a mobile phone, camera, or game player. 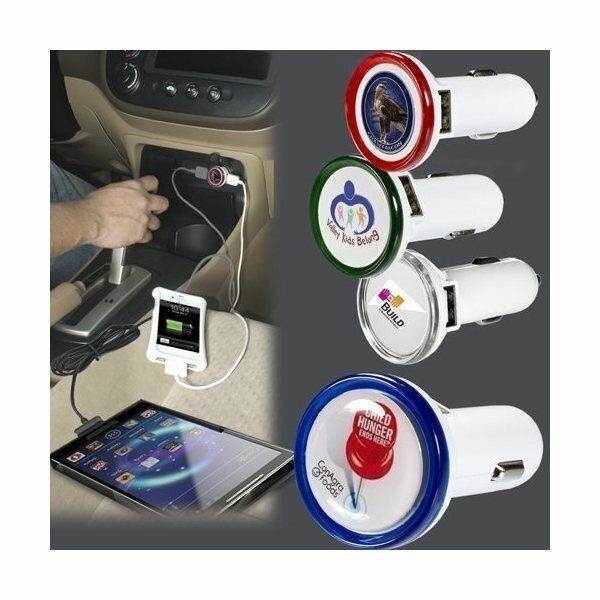 Features a durable aluminum shell, allowing you to throw this emergency charger in your bag and forget about it. Mobile Charger Power Bank Specs: Rated Voltage: 5 V; Rated Capacity: 2200mAh; Input (DC IN): 5V-500mA; Output (USB OUT): 5V 1000mA. Charge Compatibility: iPhone 6 plus, iPhone 6, iPhone 5s ,iPhone 5c, iPhone 5, iPad Mini 1, Lumia 920, Lumia 530, Lumia 630/635, Ativ S Neo, Galaxy Avant, Fire Phone, Kindle Fire HD 6"", Kindle Fire HDX 7"
To use, simply plug your device into the power bank via its standard recharging cable.